Ramnavami Pooja is held in high regards by all the Hindus all over the world. Most of the people prefer to observe a whole day fast on this day. Generally devotees prefers to be on a satvik food without salt, however there are people who also go for Nirjal fast that is fast even without water. Those who are satvik fast consume potatoes made in any form without haldi (turmeric), garlic, ginger or onion. He can also eat fruit and root vegetables of any kind. Curd, tea, coffee, milk, and water are also permitted. There is no very specific ritual to perform pooja. People visit temples and listen to stories of Ram janam (Rama's birth) and various other legends from Ramayana. Devotees also sing bhajans praising the deeds of Lord Rama, his loyal brother Lakshman, his devoted wife Sita and Rama's greatest devotee Hanuman. If the pooja is preformed at home, the home is first of all cleaned properly and pictures of Lord Rama, Lakshman, Sita and Hanuman are put on a dais in preparation for the puja. All the members of the family together worship the deity on his birthday. Devotees offer flowers, sweets and light diyas and incense sticks in order to please Lord Rama and his consort. Two thaalis are kept ready infront of the deities. One thali containing the prasada and the other containing necessary items like roli, aipun, rice, water, flowers, bell and conch for the pooja rituals. After lighting the diyas and incense sticks, devotees sprinkle holy water, roli, and aipun and rice on the deities. They also read out holy mantras in order to please thje deity. After the pooja is done, an aarti is performed and the holy water from the pooja is sprinkled over the devotees as a sign of blessing and auspiciousness from God. The youngest female member of the family then applies teeka to all the male members of the family. At the last the holy prasad is distributed among all the people who have gathered for worship. 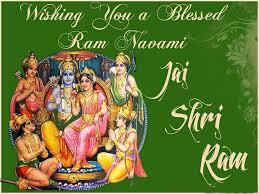 Ram Navami is one of the most ancient festivals celebrated in India. It is said that the date of Ram Navami can be traced back to the pre-christian era, as Hinduism is the oldest religion of the world. The reference of Ramnavami can also be found in the Kalika puran. It is said in the earlier times, when caste system was prevalent in India; Ramnavami was one of the few festivals that the lower castes (shudras) were allowed to celebrate. In Hindu religion, it is considered to one of the five major sacred festivals and it is said that, properly observing this fast leads to the attainment of salvation. Trilokyadhipathi Sriman , karothu Mangalam sada.